Its Xmas and I haven't posted a single cookie / Xmas-approved post all this month. Have been travelling and busy with family / friends who are visiting us. Its been non stop activities at the kids' school so they are keeping me busy. After yesterday's Low cal Cabbage Pakora, its time to cook with Cabbage - the chosen ingredient for the week. 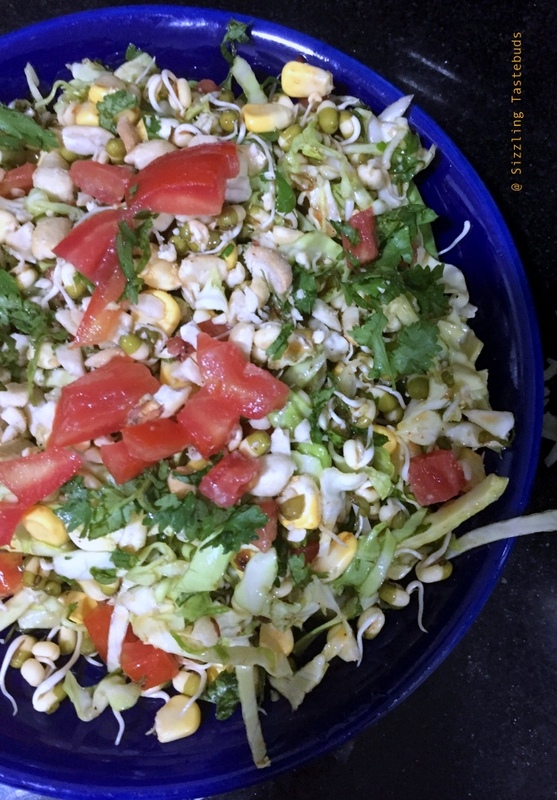 After the heavy food post the Xmas party, this is one salad thats sure to soothe your palate while filling you up with fibre and low carb calorie food. So, while I used what I had on hand, you can really go wild with any other ingredient that you fancy ! So, here's presenting a Zero cook, Low cal + Low carb Thai Inspired Cabbage-Peanut Salad. Ideal for that brunch or for those living alone in hostels / dorm or even for those lazy evenings when you can munch on a BIG bowl of this eat-as-much-as-you-like salad while surfing the net or binge watching those late night shows. Just before serving, add the dressing to the salad, mix well, top with roasted peanuts and serve immediately. Cabbage is one of the veggies which have a love-hate relationship in most families, mostly belonging to the latter category. My kids aren't picky but cabbage is not a veggie greatly appreciated at home although the elder one does eat the cabbage stir fry with Rasam . I do disguise it in many ways - Cabbage Kofta curry, Cabbage Dhokla , and three more dishes featuring cabbage will be presented this week under BM # 71 theme "One ingredient, 3 dishes". First of this is a cabbage pakora. I make it similarly to Onion pakora. and this time it was shallow fried rather than deep fried, which the family liked a lot. Next time I may even try baking this but for now lets check the recipe. Stay tuned for two more cabbage dishes next two days ! Wash and shred cabbage into thin shreds (I used a mandolin to shred cabbage into super thin thread like texture). Sprinkle little salt and leave for 5 mins. Squeeze out all the water. Now add the rest of the ingredients (and do check for salt), including the 3 tsp of oil (except that oil for frying) and mix well with your hands. Sprinkle 1-2 tsp of water if required to bind it to a rather thick mass (not flowing / dripping consistency). Heat a shallow pan and grease with oil. Take small portions of the cabbage pakora mixture, flatten it out and shallow fry drizzling a little more oil, on medium heat on both sides till crispy. PS : you may also deep fry these, in which case it can be served upto half an hour after which it will turn soggy. 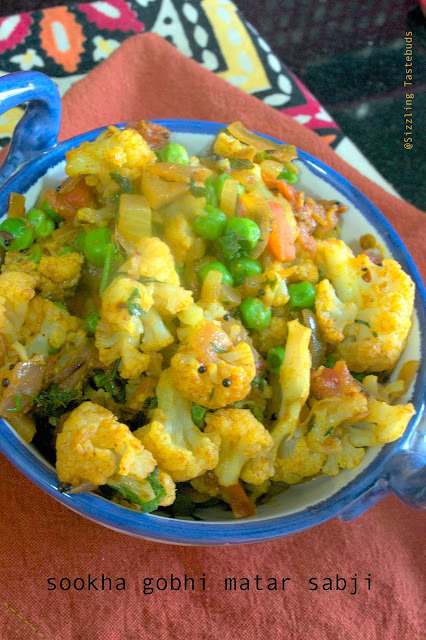 The last under seasonal produce is using two of our favourites - cauliflower & green peas. Both are abundantly available in winter and are freshest when used immediately. My local green grocer got some tender peas and fresh cauliflower and we had to make this immediately. Altho I make this thru the year with frozen peas, there's something about fresh produce that makes you go for that second helping. 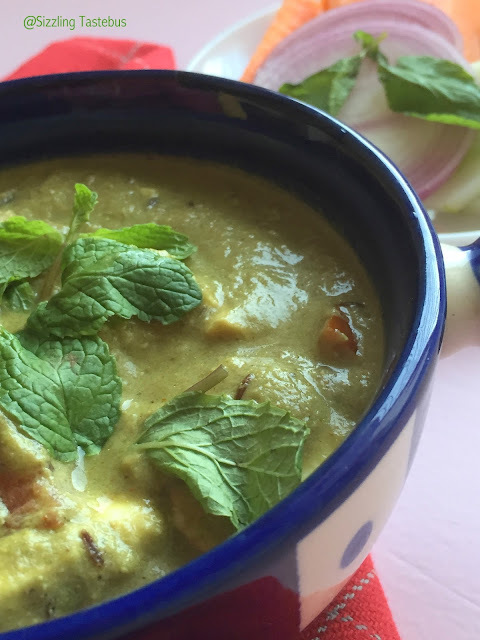 Gluten free, vegan and simple - this is a side dish that's a sure family favourite and pairs well with dal+rice or even Rotis/ Chapatis / phulkas. This can be made ahead & refrigerated in bulk too for those living alone, and re-heated in small portions over the week. Hope you enjoyed the seasonal produce theme this week with Paneer Pudinawaale & Methi-Aloo Paratha. Potato - 1 large (about 40 gms) - opt. Wash, chop & Par boil peeled and cubed potatoes, peas and cauliflower for 6-7 mins. They should be 80% done. I usually pop these three veggies into the microwave with a pinch of salt for 5-6 mins. Now add the chopped tomatoes & saute till tomatoes turn soft. Add salt at this stage. Add the spice powders and the par boiled veggies, sprinkle very little water and cook covered for 4-5 mins till the veggies are done (avoid shaking or tossing them repeatedly - they would lose their shape and texture). After yesterday's Paneer Pudinawaale using one favourite herb - Mint , we move onto another of our winter favourites - fenugreek leaves or Methi (as its locally called). I do have access to methi leaves through the year, but in winters, the quality of the methi is delicious, and we cook with this almost thrice a week. 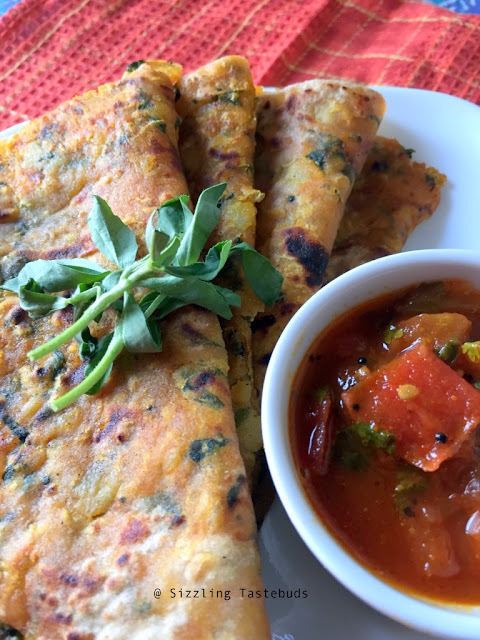 Methi Thepla is my elder kid's favourite, and today I made a twist with the usual Thepla and made a thickish Paratha. This tastes good when hot, but equally tasty when carried for a lunchbox. 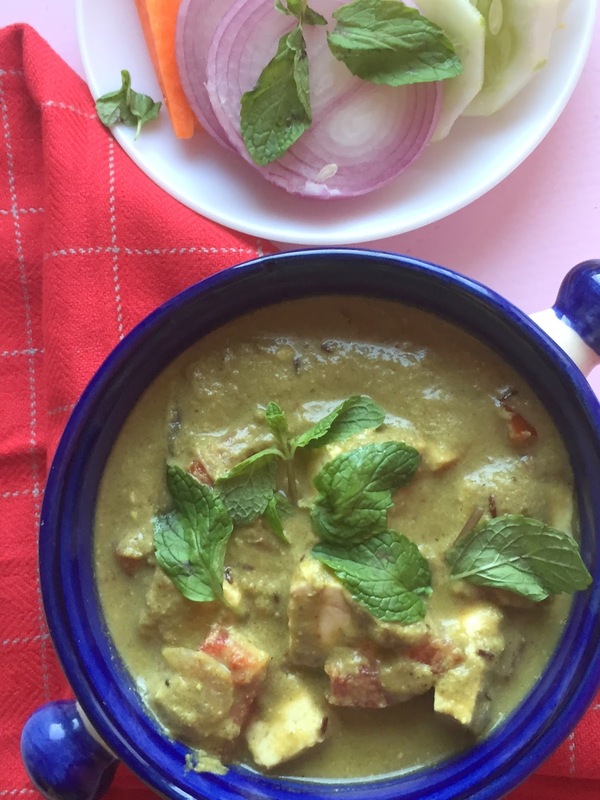 Team with a tomato relish or even a pickle and some curd for a filling meal. Boil, peel and mash potatoes and keep aside. In a large bowl, add the chopped methi leaves, sprinkle a little salt and keep aside for 5 mins till it leaves a little water. Now add the mashed potatoes, turmeric, crushed coriander seeds, flour, salt, dry spices, and mash well till potatoes are incorporated into the flour. Sprinkle warm water a little at a time, and knead to a semi soft dough. Apply a TBSP of oil and knead once more. Heat a cast iron tava (skillet). 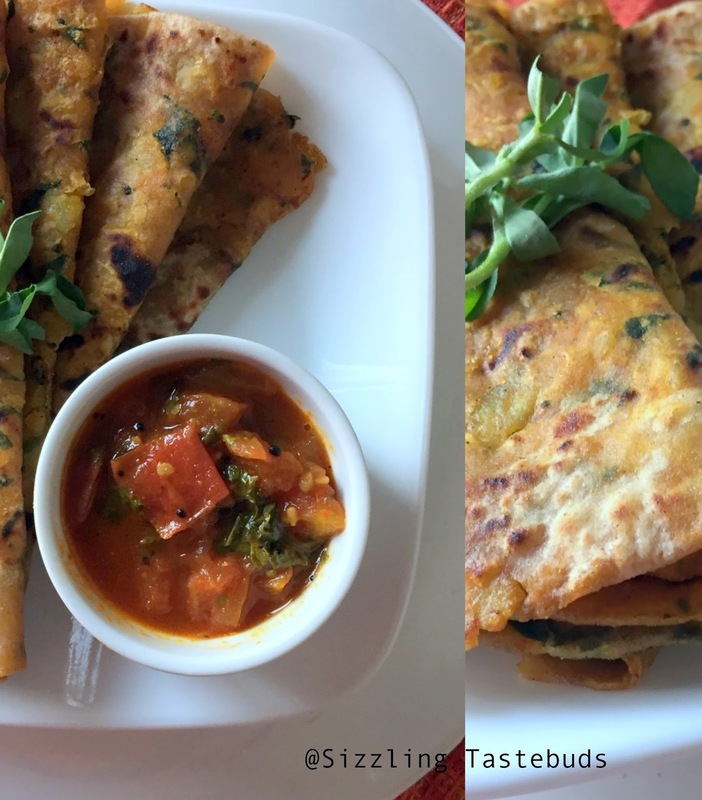 Roll out thickish parathas with a rolling pin of sizeable thickness. Roast on a hot tava on one side (drizzle a little oil). 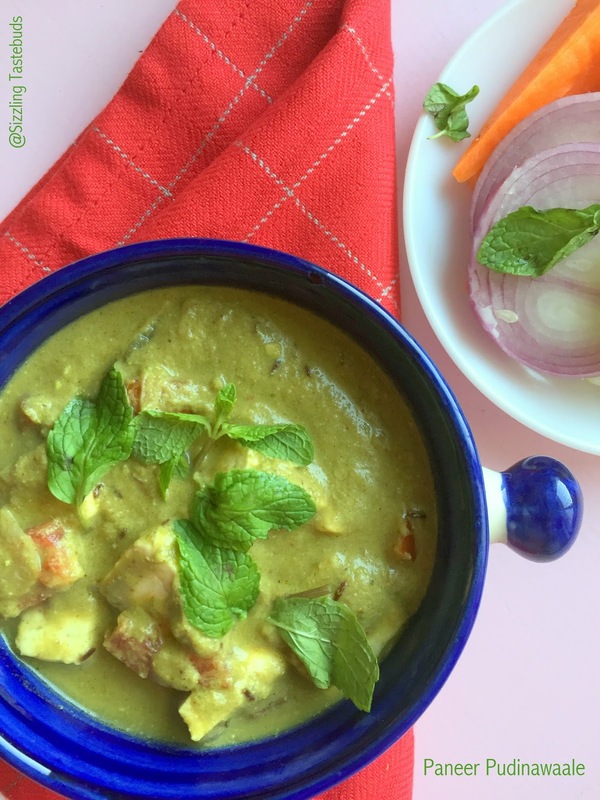 We enter this week's theme of "Seasonal Produce". . Fresh, green Mint is abundantly available in the winter, and so this dish is a treat for those chilly evenings, when this makes an absolutely great dish to serve with Roti / Parathas. 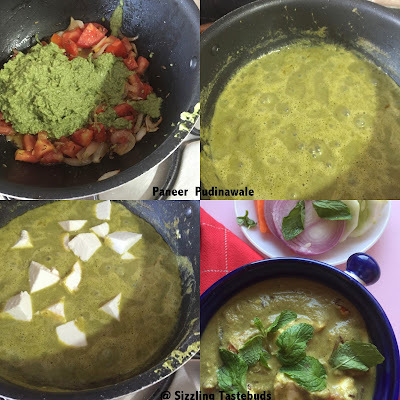 Paneer is one of the most sought after ingredient at home - my elder one absolutely loves it, and although I make it atleast once in a fortnight, she wudnt mind having it more frequently..
We make Zero Oil Palak Paneer, Paneer Kulcha, Spinach and Paneer Cheese Tarts, Shahi Paneer Masala regularly, but my favourite till date is Methi Chaman : there's something magical about fresh (or dried) fenugreek that makes it so earthy and perks up any dish. Talking about perking up a dish, and we wouldnt want to miss out on Mint. Soak the cashew nuts & poppy seeds separately in warm water for 10 mins. grind these with the Mint, ginger and garlic to a smooth paste. Saute the Onion and tomato in 1 TBSP oil for 3-4 mins. In the same pan, add the ground mint paste & saute well for 3-4 mins till raw smell disappears. Add the salt, spice powders and let it simmer on a low flame. Add 1/4 cup of water if need be to make a thinner gravy. Check for spices and slowly add the fried paneer (drained), let it simmer on very low flame for further 2-3 mins.